A (Audience) Your loved ones back in District 12: your mother, Prim, Gale, Madge and residence in the Seam. F (Format) A personal letter or letters. T (Topic) This is the time to say your final goodbyes. You know that you will not be returning and your final words may be the only thing that can bring your loved ones peace. Let them know what they meant to you, as well as your wishes for them as they try to move on in a world without you. When Katniss and Peeta attend the banquet in the Capitol, she notices that her mockingjay has spawned a new fashion sensation (page 78). When she returns home, she talks about the mockingjay being a symbol of the rebellion (pages 91-92). Using text evidence, contrast what the mockingjay symbolizes to members of the Capitol with what it symbolizes to the rebels in the Districts. Infer what the mockingjay might symbolize to President Snow. 1. Identify a conflict and explain what type of conflict it is (Internal: Character vs. Self) or (External: Character vs Character, Nature, or Society.) Make a prediction about how you think the conflict will be resolved. 2. Cite text evidence to explain how the author revealed information about a character: dialogue, description, internal thoughts. 3. Cite text evidence to explain how the author uses dialogue to reveal information about a character, move the story forward or provoke a character to made a decision. 4. The author only gives us Katniss's thoughts. How would this story be different if it were told from another character's perspective? Write 5 lines explaining what you think another character might be thinking or feeling in this section. 5. Student choice: Write 5 lines on anything Catching Fire related: questions you have, what you hope is included in the movie, something you are wondering about, a part that confuses you. Dialogue is written conversation between two or more characters. In fiction, dialoge is usually set off with quotation marks. Writers use dialogue to reveal information about a character, move the story along, or provoke characters into making decisions. 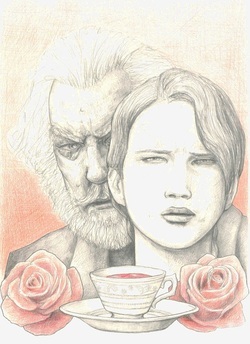 As you read chapter two, pay specific attention to the dialogue between Katniss and President Snow. Focus on what they are talking about, and how their conversation will affect Katniss's future decisions. After we read chapter 1 we will work together as a class to anayze the dialogue on pages 20-21 and 28-29. The mood in a story is the feeling or atmosphere the writer creates. Life back in District 12 has changed for Katniss, now that she has returned a victor from the Hunger Games. Using text evidence, describe two ways life has changed for Katniss. Explain how these changes affect the mood in chapter 1. Catching Fire: Part 1 "The Spark"
Against all odds, Katniss has survived the Hunger Games. She and fellow District 12 tribute Peeta Mellark are miraculously still alive. Katniss should be relieved, happy even. Yet nothing is the way Katniss wishes it to be. Gale holds her at an icy distance. Peeta has turned his back on her completely. And there are whispers of a rebellion against the Capitol --a rebellion that Katniss and Peeta may have helped create. Much to her shock, Katniss has fueled an unrest that she's afraid she cannot stop. And what scares her even more is that she's not entirely convinced she should try. As time draws near for Katniss and Peeta to visit the districts on the Capital's cruel Victory Tour, the stakes are higher than ever. If they can't prove, without a shadow of a doubt, that they are lost in their love for each other, the consequences will be horrifying. Katniss is about to be tested as never before. Type 2: Using text evidence to support your opinion, write 8 lines explaining why you think the second book in the Hunger Games series is called Catching Fire. Hunger Games Review: Part III "The Victor"
Chapter 19: What events prompt Katniss to go looking for Peeta? Describe the condition Peeta is in when she finds him. Chapter 20: What gift does Katniss receive in a silver parachute? What does she use it for? Chapter 21: Why does Thresh spare Katniss's life? Chapter 22: Contrast the way Katniss and Peeta feel about each other. Chapter 23: What events cause Foxface's death? Chapter 25: Contrast Peeta and Katniss's reasons for wanting to eat the nightlock berries. 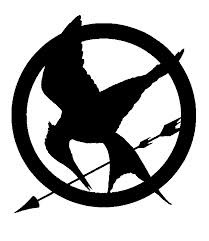 Chapter 26: Why do you think Katniss believes "that the most dangerous part of the Hunger Games is about to begin"? In your opinion, are her feelings valid? or is she overreacting? Hunger Games Review: Part II "The Games"
Chapters 11-12: Identify an example of a character vs. character conflict, and a character vs. nature conflict from this section. Explain which conflict you think would be the most difficult to face. Chapter 13: How does the Capital interfere in the games? What do you think is most likely their motivation for doing this? Chapters 14 -15: Describe Katniss's relationship with Rue. Chapter 18: What can you infer about Distric 11's action of sending Katniss the gift of bread?